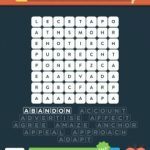 Stuck in Wordbrain 2 Verbs that Start With A (Word Overlord 8×8). Here are the answers. Do you have a video for this? I need the sequence. It’s driving me nuts and can’t finish it. Why does everyone write answers on a page that is here to give answers? ?